Stipple quilting – or “stippling” – is a continuous, curving line of stitching that never crosses over itself. It is a random, free-motion technique that is not marked on the quilt. The shape of the stitches has been described many ways, including puzzle pieces, vermicelli, coral, or little mittens! Traditionally, true stippling was characterized by 1/8-inch spacing between the lines. We now tend to apply the term to lines spaced as much as 1/4″ to 1/2″ apart, but anything further apart would be considered meander quilting. Stippling does a great job of condensing the background and bringing adjacent unquilted areas into high relief. 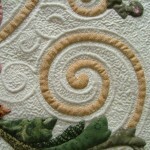 It is often used to surround appliqué and quilting motifs for this very reason. Micro stippling adds visual texture and can actually create a sculpted or embossed effect. A question I am frequently asked is this: how do you make your stippling so small? Or, how do you get the stitching lines so close together? I find it difficult to respond to these inquiries and not because the explanation is long and technical. Basically, micro stippling is done the same way as regular stippling – there is just less space between the lines of stitching. Somehow this answer doesn’t seem satisfactory, so I decided to make a video and show you. But first, here are a few tips for adding micro stippling to your quilts. Start with a fresh new needle and change needles regularly. It is surprising how even a small nick or burr, undetectable to the eye, can be detrimental to the stitch quality. I like to machine quilt with Microtex or Topstitch needles and used to recommend a size 70/10 or even a 60/8 needle for very fine threads. But I recently learned that occasional looping and catching of the needle thread under the throat plate can be caused by a too-small needle so I am now sticking with a size 80/12 needle. A single hole face plate will also help prevent skipped stitches and thread looping. 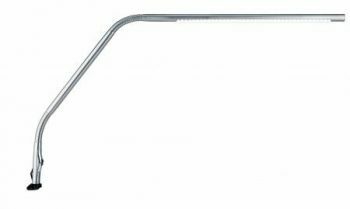 Use a fine, light-weight thread in the sewing machine needle and bobbin. Some of my favorites are Aurifil Mako 50-weight cotton thread, Superior Thread’s The Bottom Line polyester thread, and silk thread. If the thread color matches the background fabric, its impact is primarily textural; if the thread is contrasting, it can virtually change the color of the background fabric. Basting the three quilt layers together properly is extremely important. 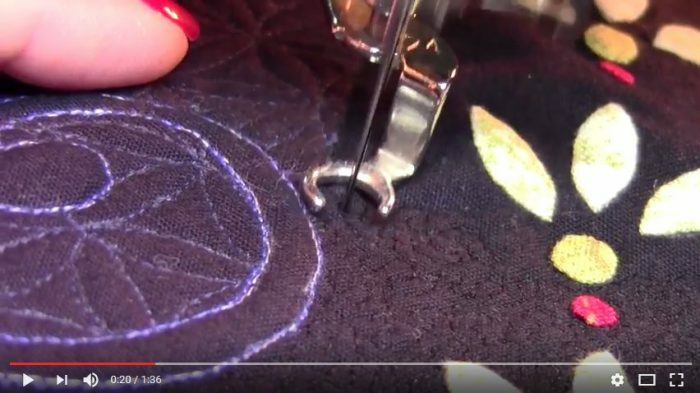 I use small safety pins (none of which are visible in the video) but you can read more in my post Basting for Machine Quilting. I don’t wear anything on my hands when I am machine quilting, but many people like to wear special gloves or rubber finger tips to help them grip the fabric. Good lighting is essential. An Ott floor lamp over my sewing machine works well, but I have recently acquired an LED Slimline desk light which is wonderful. Typically we sew from top to bottom, pushing the fabric away from us as we work. When stippling, I do the reverse. I start at the bottom and stitch toward the top, pulling the fabric towards me as I go. This allows me to better see the areas that have already been filled with micro stippling. Stitch right up to the edges of each area that is being filled with micro stippling, whether it is an appliqué shape or a quilted motif. This will compress the background around the shapes and bring them into high relief. Here’s how it looks in action!